Need a place to have a good time? Call us. Santa Fe Brewing Company has two unique event spaces that can accommodate beer-loving groups of almost any size. Check out the links below for more information. If you’re looking to host a smaller event (or just prefer the predictability of a venue with a roof), The Bridge indoor venue is ideal. This space features a 25-foot long stage with capacity for 400 people on the floor and upstairs balcony area. This indoor space also includes a custom built bar serving Santa Fe Brewing Company craft beer imported from across the parking lot. The Bridge outdoor venue is a unique, open air space with mountains on one side and an award-winning brewery on the other. It is one of the few spaces in Santa Fe that is large enough to host bigger concerts and events, with a capacity of 1000 people. This space features a 25 foot long stage and is outfitted with top-quality PA equipment. Also, did we mention there’s a brewery next door? 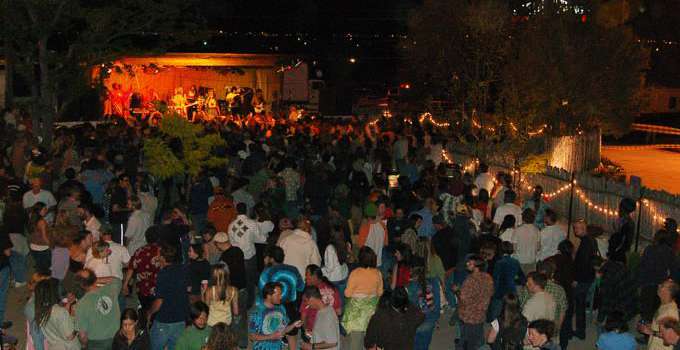 For Bands looking to book a venue, contact dakotah@santafebrewing.com. If you hosting a private party and are looking to reserve the indoor or outdoor space at The Bridge, please contact info@santafebrewing.com. Our in house management team can answer any questions about renting The Bridge at Santa Fe Brewing Company.